13 — 2 Irwin/Mc. Graw-Hill ©The Mc. Graw-Hill Companies, Inc. , 2000 Leadership is the process where a person exerts influence over others and inspires, motivates and directs their activities to achieve goals. Effective leadership increases the firm’s ability to meet new challenges. Leader : The person exerting the influence. 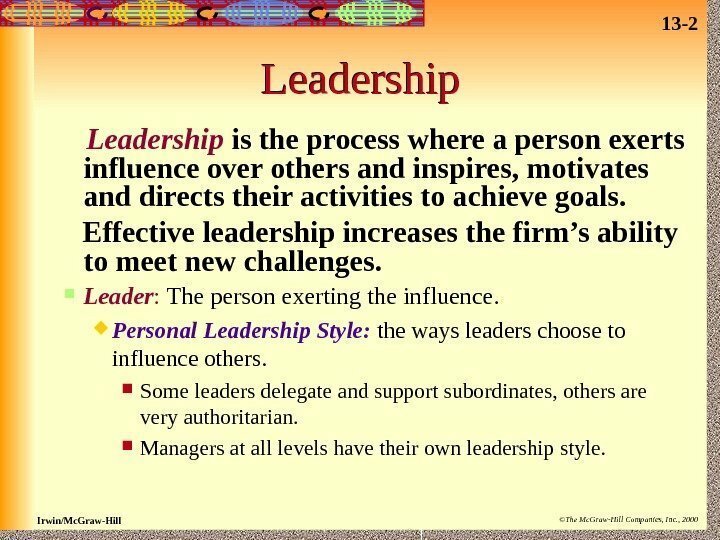 Personal Leadership Style: the ways leaders choose to influence others. Some leaders delegate and support subordinates, others are very authoritarian. Managers at all levels have their own leadership style. 13 — 3 Irwin/Mc. Graw-Hill ©The Mc. Graw-Hill Companies, Inc. , 2000 Leadership Across Cultures Leadership styles may vary over different cultures. European managers tend to be more people-oriented than American or Japanese managers. 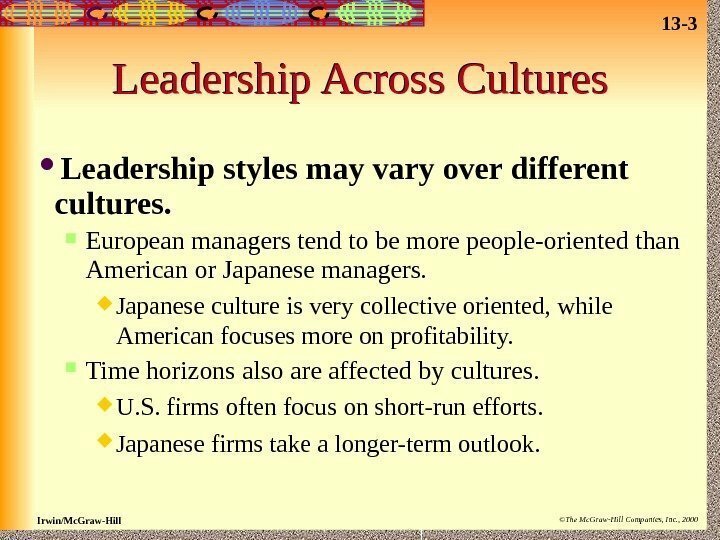 Japanese culture is very collective oriented, while American focuses more on profitability. Time horizons also are affected by cultures. U. S. firms often focus on short-run efforts. Japanese firms take a longer-term outlook. 13 — 4 Irwin/Mc. Graw-Hill ©The Mc. Graw-Hill Companies, Inc. , 2000 Sources of Power Reward Power Legitimate Power Coercive Power Expert Power Referent Power. Enable managers to be leaders & influenceleaders & influence subordinates to achieve goalsachieve goals. Figure 13. 13 — 5 Irwin/Mc. Graw-Hill ©The Mc. Graw-Hill Companies, Inc. , 2000 Sources of Power Used to affect other’s behavior and get them to act in given ways. 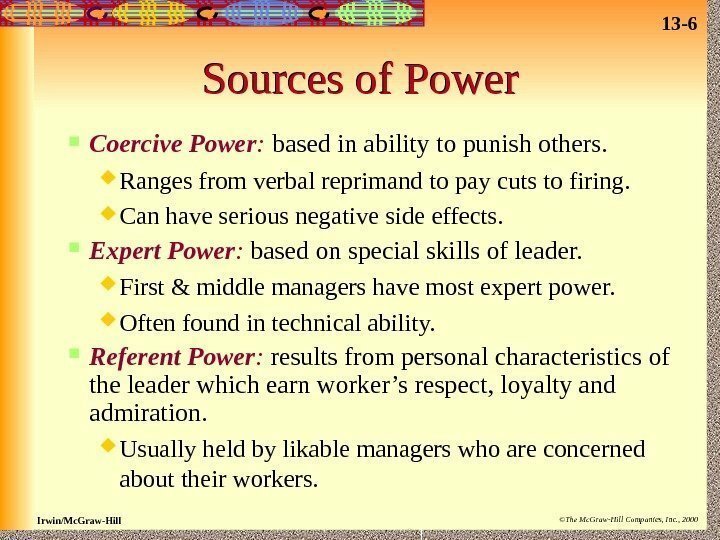 Legitimate Power : manager’s authority resulting by their management position in the firm. Can be power to hire/fire workers, assign work. 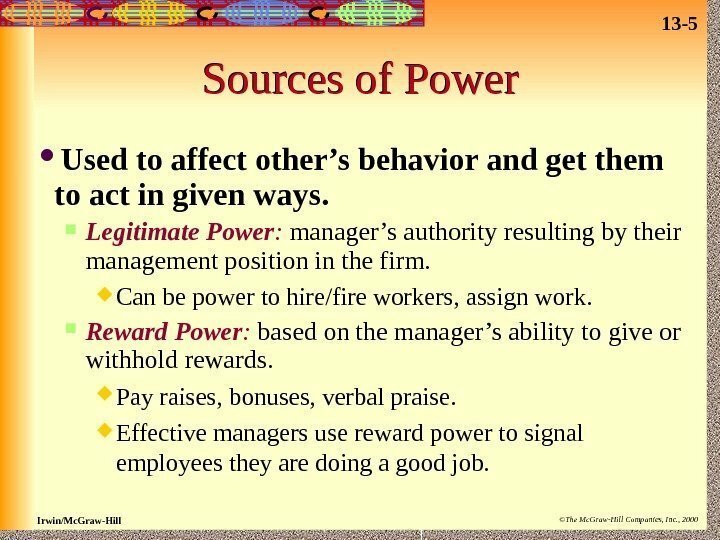 Reward Power : based on the manager’s ability to give or withhold rewards. Pay raises, bonuses, verbal praise. Effective managers use reward power to signal employees they are doing a good job. 13 — 6 Irwin/Mc. Graw-Hill ©The Mc. Graw-Hill Companies, Inc. , 2000 Sources of Power Coercive Power : based in ability to punish others. Ranges from verbal reprimand to pay cuts to firing. Can have serious negative side effects. Expert Power : based on special skills of leader. First & middle managers have most expert power. Often found in technical ability. Referent Power : results from personal characteristics of the leader which earn worker’s respect, loyalty and admiration. Usually held by likable managers who are concerned about their workers. 13 — 7 Irwin/Mc. Graw-Hill ©The Mc. Graw-Hill Companies, Inc. , 2000 Empowerment Process of giving workers at all levels authority to make decisions and the responsibility for their outcomes. 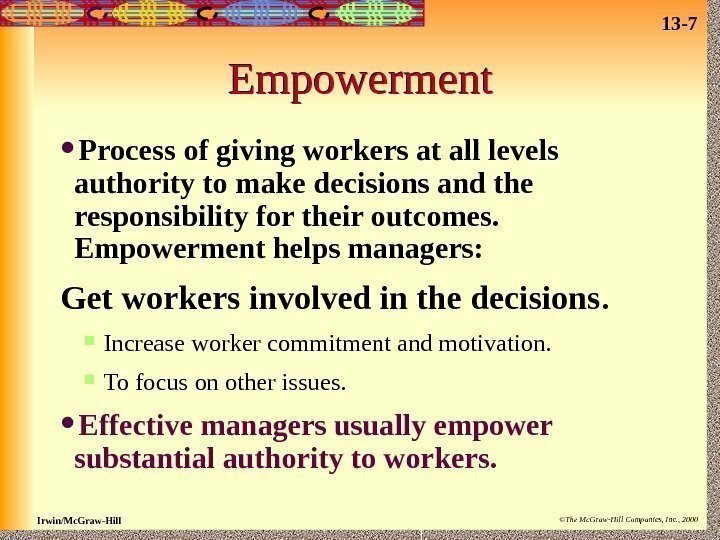 Empowerment helps managers: Get workers involved in the decisions. Increase worker commitment and motivation. To focus on other issues. 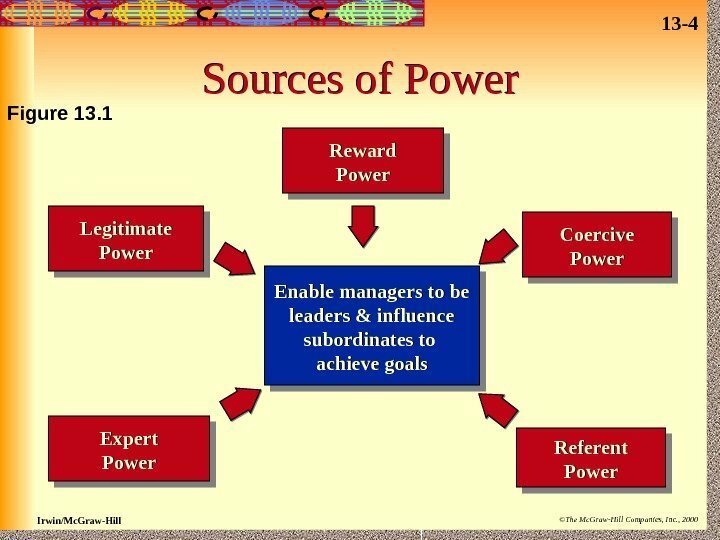 Effective managers usually empower substantial authority to workers. 13 — 8 Irwin/Mc. Graw-Hill ©The Mc. 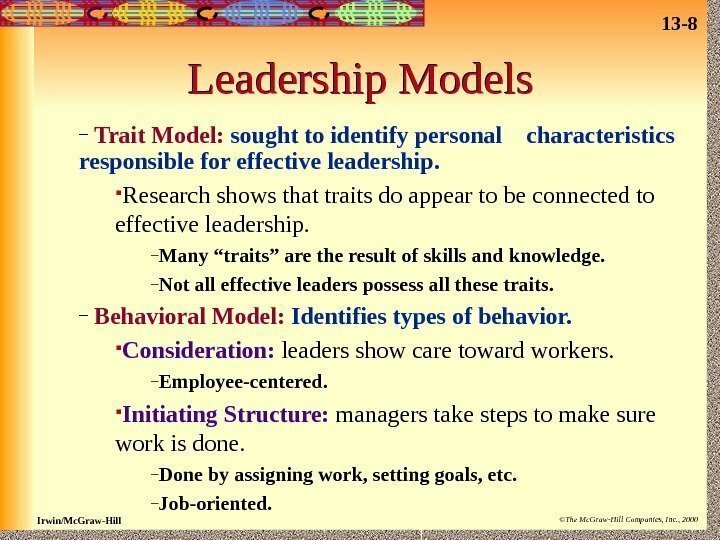 Graw-Hill Companies, Inc. , 2000 Leadership Models – Trait Model: sought to identify personal characteristics responsible for effective leadership. Research shows that traits do appear to be connected to effective leadership. – Many “traits” are the result of skills and knowledge. – Not all effective leaders possess all these traits. – Behavioral Model: Identifies types of behavior. Consideration: leaders show care toward workers. – Employee-centered. Initiating Structure: managers take steps to make sure work is done. – Done by assigning work, setting goals, etc. – Job-oriented. 13 — 9 Irwin/Mc. Graw-Hill ©The Mc. 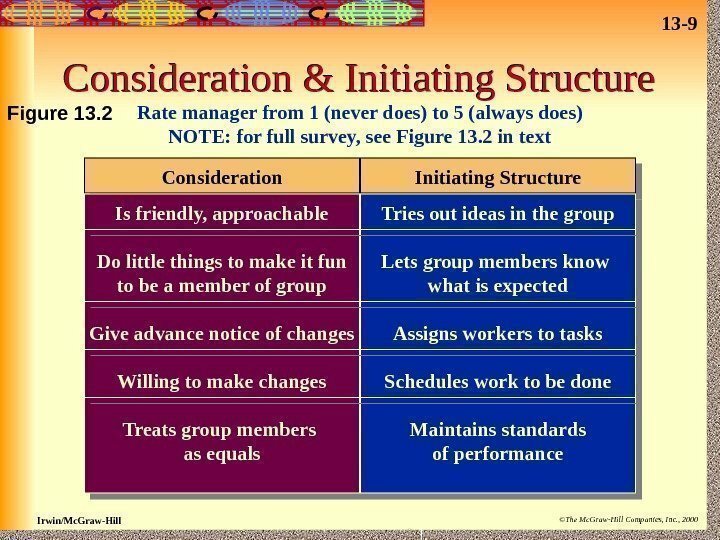 Graw-Hill Companies, Inc. , 2000 Consideration Initiating Structure. Consideration & Initiating Structure Is friendly, approachable Do little things to make it fun to be a member of group Give advance notice of changes Willing to make changes Treats group members as equals Tries out ideas in the group Lets group members know what is expected Assigns workers to tasks Schedules work to be done Maintains standards of performance. Rate manager from 1 (never does) to 5 (always does) NOTE: for full survey, see Figure 13. 2 in text. Figure 13. 13 — 10 Irwin/Mc. Graw-Hill ©The Mc. 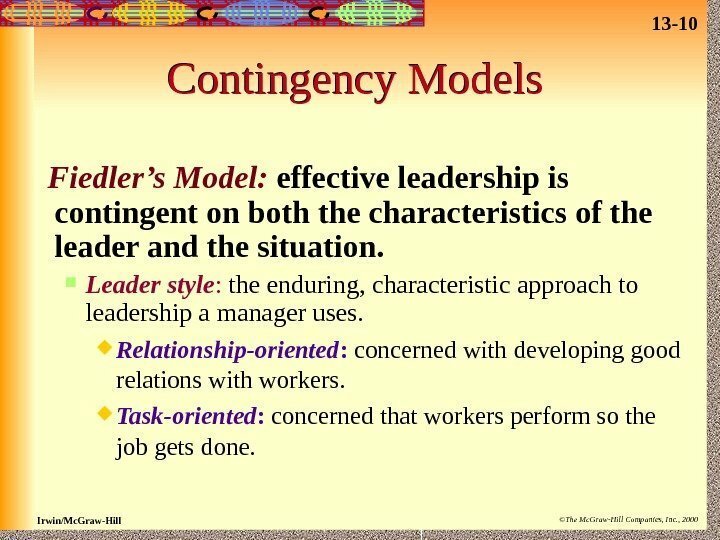 Graw-Hill Companies, Inc. , 2000 Contingency Models Fiedler’s Model: effective leadership is contingent on both the characteristics of the leader and the situation. Leader style : the enduring, characteristic approach to leadership a manager uses. Relationship-oriented : concerned with developing good relations with workers. Task-oriented : concerned that workers perform so the job gets done. 13 — 11 Irwin/Mc. Graw-Hill ©The Mc. 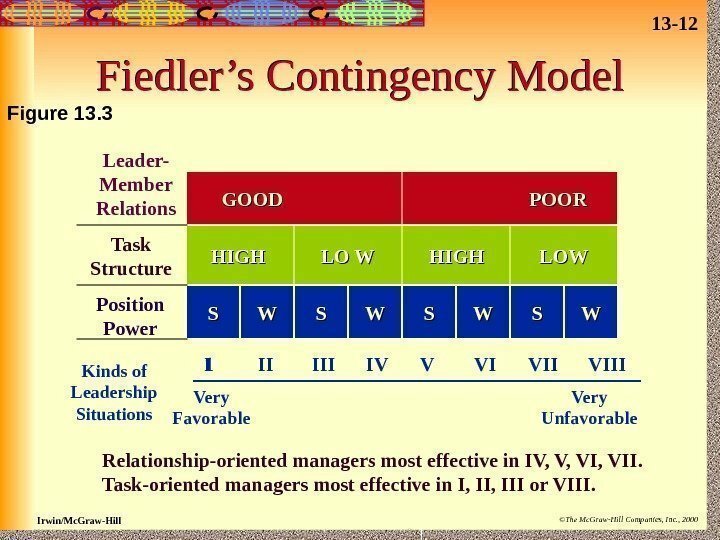 Graw-Hill Companies, Inc. , 2000 Fiedler’s Model Situation characteristic : how favorable a given situation is for leading to occur. Leader-member relations : determines how much workers like and trust their leader. Task structure : extent to which workers tasks are clear-cut. Clear issues make a situation favorable for leadership. Position Power : amount of legitimate, reward, & coercive power a leader has due to their position. When positional power is strong, leadership opportunity becomes more favorable. 13 — 12 Irwin/Mc. Graw-Hill ©The Mc. Graw-Hill Companies, Inc. , 2000 Fiedler’s Contingency Model GOOD POOR HIGH LO W HIGH LOW SS WWLeader- Member Relations Task Structure Position Power Kinds of Leadership Situations Very Favorable Very Unfavorable. I II IV V VI VIII 1 Relationship-oriented managers most effective in IV, V, VII. Task-oriented managers most effective in I, III or VIII. Figure 13. 13 — 13 Irwin/Mc. Graw-Hill ©The Mc. 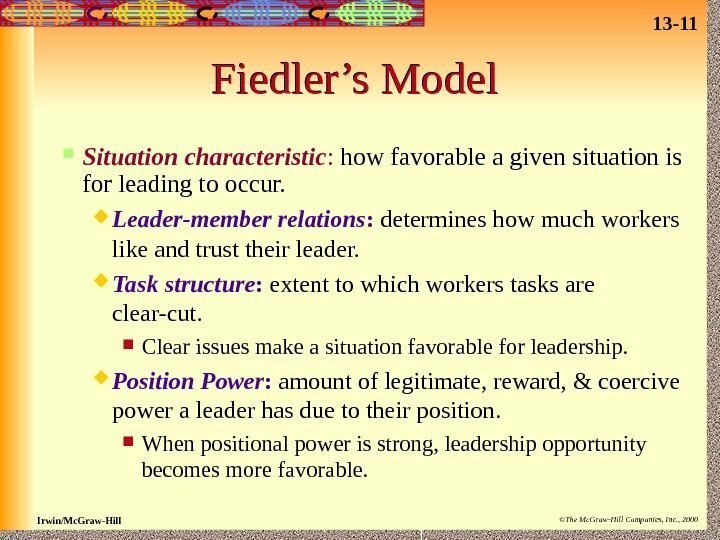 Graw-Hill Companies, Inc. , 2000 Using Fiedler’s Model Can combine leader-member relations, task structure, and position power to identify leadership situations. Identifies situations where given types of managers might perform best. Seen in Figure 13. 4. 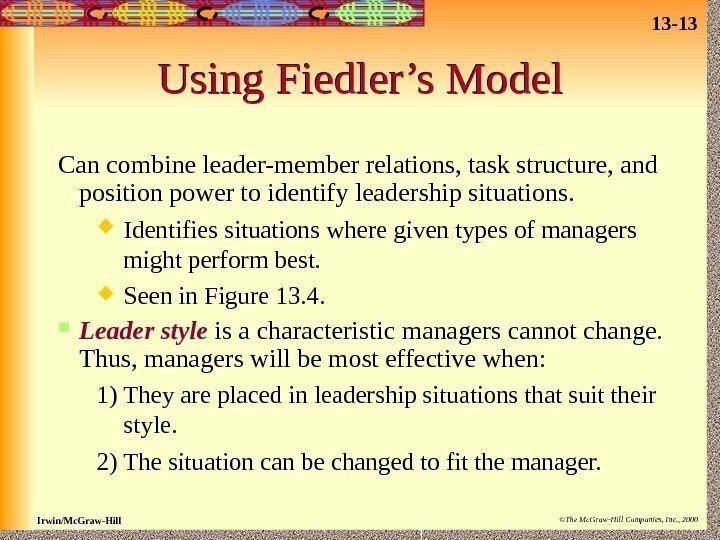 Leader style is a characteristic managers cannot change. Thus, managers will be most effective when: 1) They are placed in leadership situations that suit their style. 2) The situation can be changed to fit the manager. 13 — 14 Irwin/Mc. Graw-Hill ©The Mc. 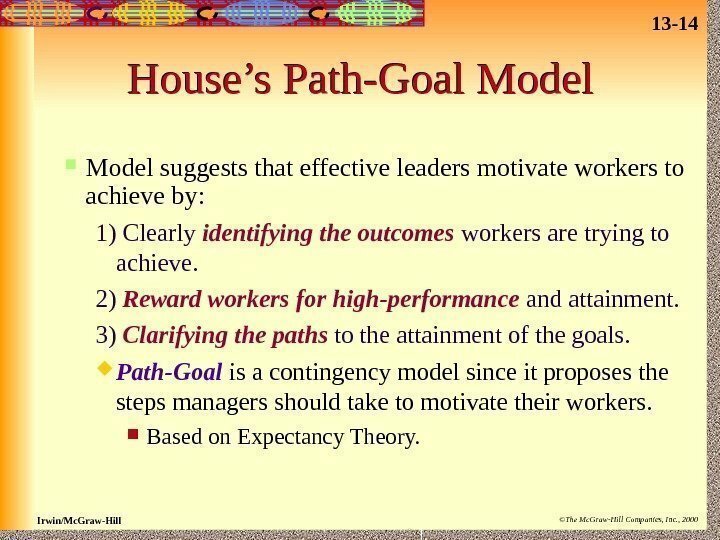 Graw-Hill Companies, Inc. , 2000 House’s Path-Goal Model suggests that effective leaders motivate workers to achieve by: 1) Clearly identifying the outcomes workers are trying to achieve. 2) Reward workers for high-performance and attainment. 3) Clarifying the paths to the attainment of the goals. Path-Goal is a contingency model since it proposes the steps managers should take to motivate their workers. Based on Expectancy Theory. 13 — 15 Irwin/Mc. Graw-Hill ©The Mc. 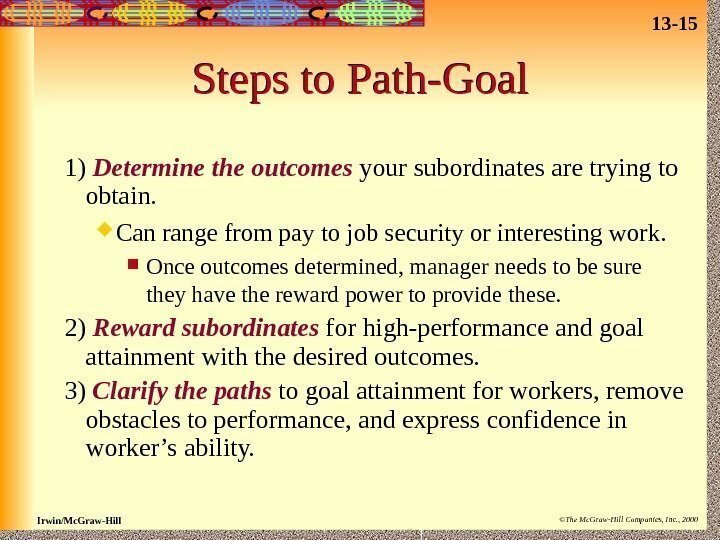 Graw-Hill Companies, Inc. , 2000 Steps to Path-Goal 1) Determine the outcomes your subordinates are trying to obtain. Can range from pay to job security or interesting work. Once outcomes determined, manager needs to be sure they have the reward power to provide these. 2) Reward subordinates for high-performance and goal attainment with the desired outcomes. 3) Clarify the paths to goal attainment for workers, remove obstacles to performance, and express confidence in worker’s ability. 13 — 16 Irwin/Mc. Graw-Hill ©The Mc. 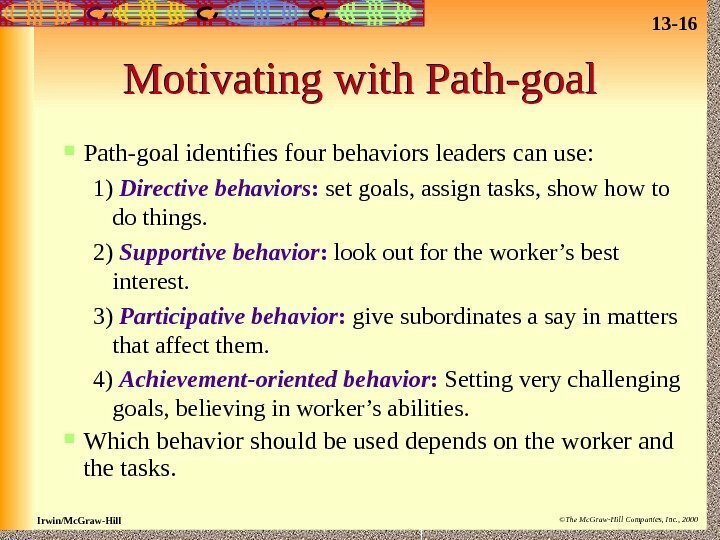 Graw-Hill Companies, Inc. , 2000 Motivating with Path-goal identifies four behaviors leaders can use: 1) Directive behaviors : set goals, assign tasks, show to do things. 2) Supportive behavior : look out for the worker’s best interest. 3) Participative behavior : give subordinates a say in matters that affect them. 4) Achievement-oriented behavior : Setting very challenging goals, believing in worker’s abilities. Which behavior should be used depends on the worker and the tasks. 13 — 17 Irwin/Mc. Graw-Hill ©The Mc. 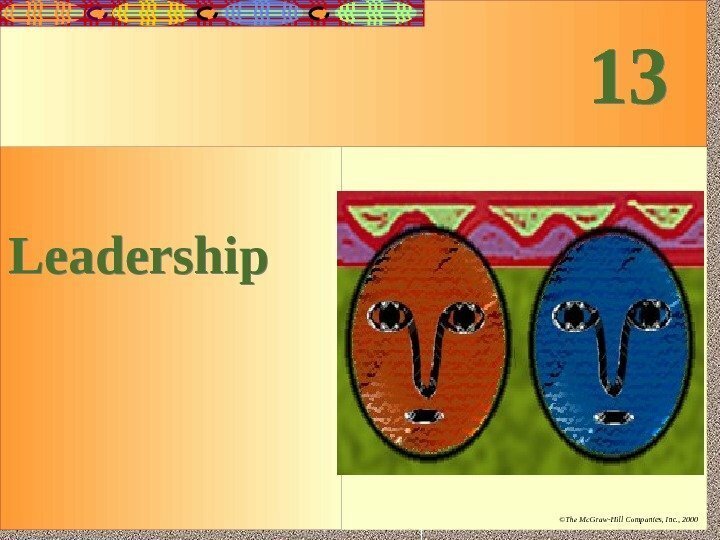 Graw-Hill Companies, Inc. , 2000 Leader-Substitute Model Leadership substitute: acts in the place of a leader and makes leadership unnecessary. 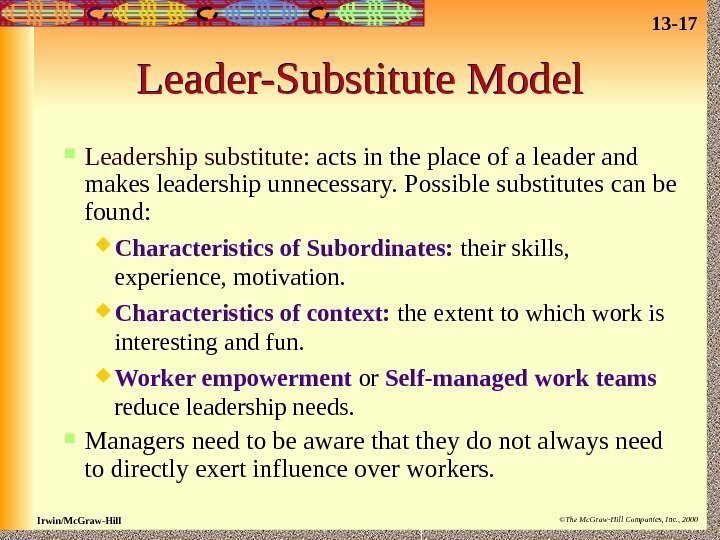 Possible substitutes can be found: Characteristics of Subordinates: their skills, experience, motivation. Characteristics of context: the extent to which work is interesting and fun. Worker empowerment or Self-managed work teams reduce leadership needs. Managers need to be aware that they do not always need to directly exert influence over workers. 13 — 18 Irwin/Mc. Graw-Hill ©The Mc. 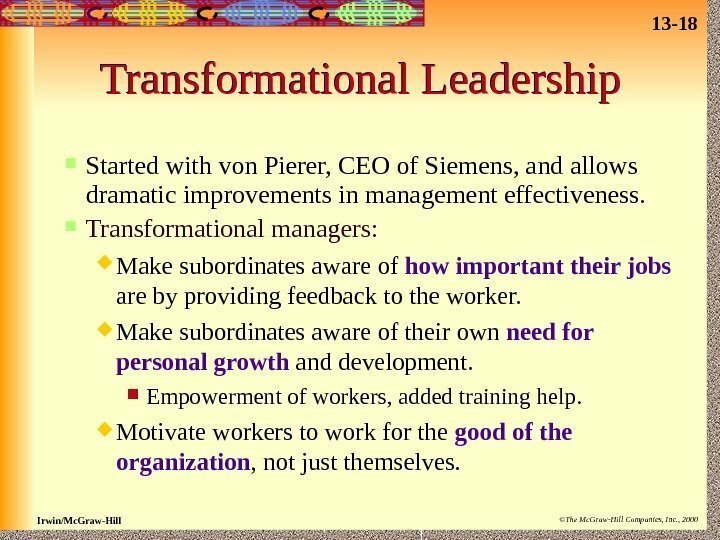 Graw-Hill Companies, Inc. , 2000 Transformational Leadership Started with von Pierer, CEO of Siemens, and allows dramatic improvements in management effectiveness. Transformational managers: Make subordinates aware of how important their jobs are by providing feedback to the worker. Make subordinates aware of their own need for personal growth and development. Empowerment of workers, added training help. Motivate workers to work for the good of the organization , not just themselves. 13 — 19 Irwin/Mc. Graw-Hill ©The Mc. 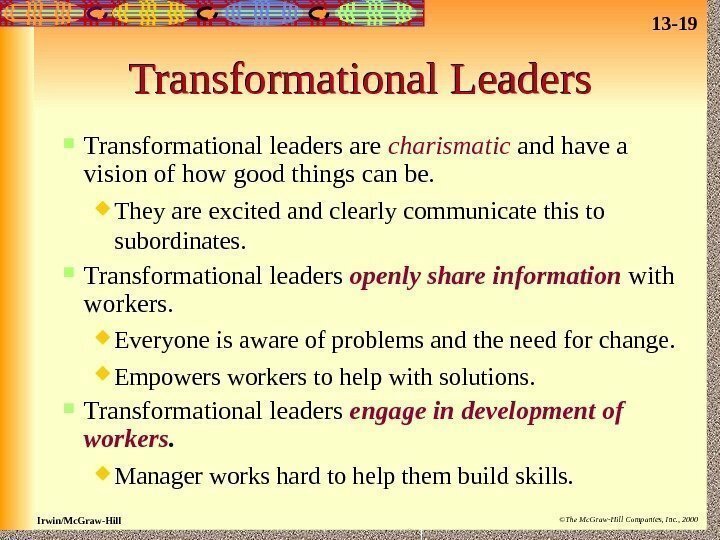 Graw-Hill Companies, Inc. , 2000 Transformational Leaders Transformational leaders are charismatic and have a vision of how good things can be. They are excited and clearly communicate this to subordinates. Transformational leaders openly share information with workers. Everyone is aware of problems and the need for change. Empowers workers to help with solutions. Transformational leaders engage in development of workers. Manager works hard to help them build skills. 13 — 20 Irwin/Mc. Graw-Hill ©The Mc. Graw-Hill Companies, Inc. , 2000 Transactional Leadership Involves managers using the reward and coercive power to encourage high performance. Managers who push subordinates to change but do not seem to change themselves are transactional. 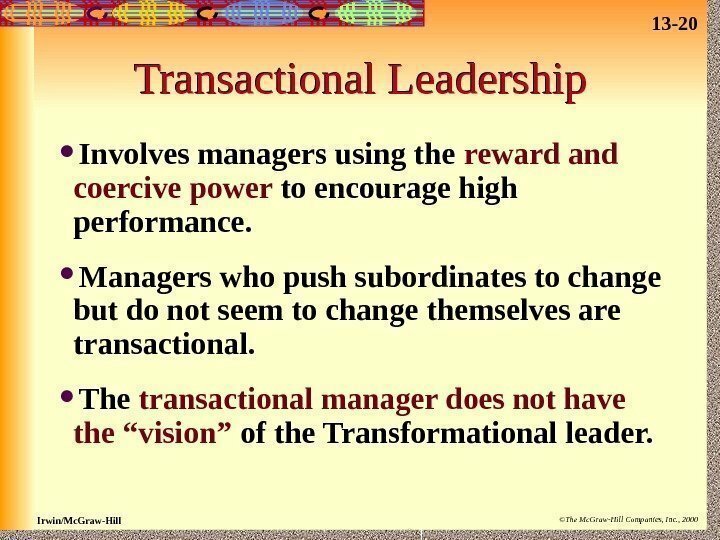 The transactional manager does not have the “vision” of the Transformational leader. 13 — 21 Irwin/Mc. Graw-Hill ©The Mc. Graw-Hill Companies, Inc. , 2000 Gender and Leadership The number of women managers is rising but still relatively low in top levels. Stereotypes suggest women are supportive and concerned with interpersonal relations. Similarly, men are seen as task-focused. 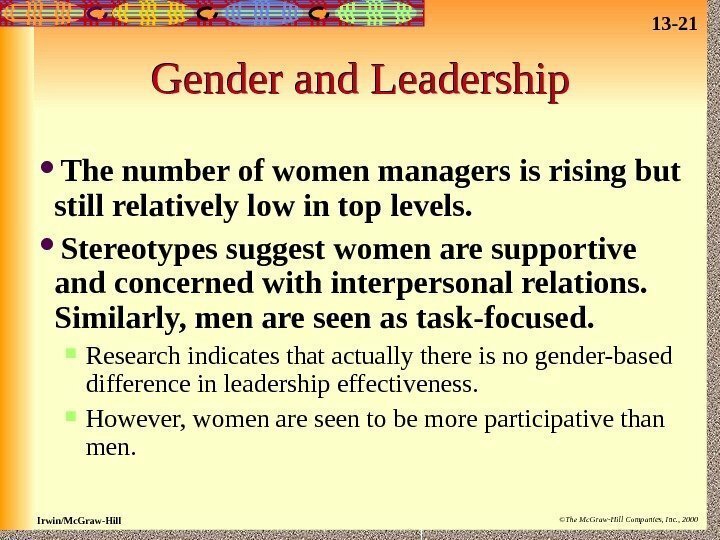 Research indicates that actually there is no gender-based difference in leadership effectiveness. However, women are seen to be more participative than men.